In the death of Charles A. FLANAGAN of 506 Second Avenue, Astoria has lost one of its best known citizens. Mr FLANAGAN was born in Astoria 66 years ago on 2nd Ave just opposite the house where he died. Since he married Miss Anna EVANS 39 years ago he has lived in the same house continuously. Mr FLANAGAN was a member of the police dept in L.I.C. for 37 years until his retimement 3 years ago. He joined the LIC police force in 1880 and was a member of the Astoria precinct until consolidation. For 12 years Mr FLANAGAN was detailed for duty at the tax office in the borough hall and 2 years he was with the board of health in Jamaica. He was a member of the Lincoln council, The Knights of Columbus, Holy Name Soc of Our Lady of Mt Carmel, Veteran Firemen's assn. Until 10 months [weeks] ago, Mr FLANAGAN enjoyed perfect health. At that time he suffered a stroke of paralyses from which he never fully recovered. 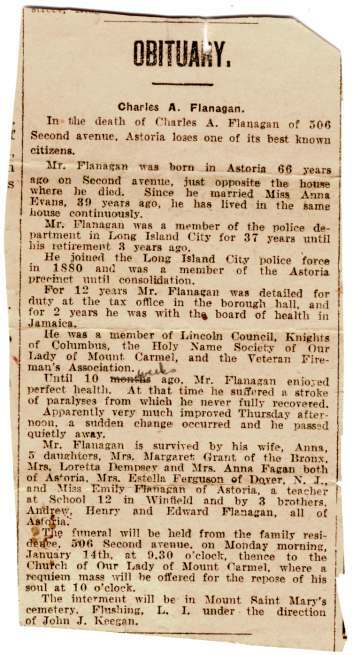 Mr. FLANAGAN is survived by his wife Anna, 5 daughters, Mrs Margaret GRANT of the Bronx, Mrs Loretta DEMPSEY & Mrs Agnes FAGAN both of Astoria, Mrs Estella FERGUSON of Dover N.J., and Miss Emily FLANAGAN of Astoria, a teacher at School 12 in Winfield, and by 3 brothers, Andrew, Henry and Edward FLANAGAN, all of Astoria. The funeral will be held at the family residence 506 Second Ave, on Monday morning Jan 14th at 9:30. thence to Our Lady of Mt Carmel, 10am. where a scheduled requiem mass will be offered for the repose of his soul. The interment will be in Mount St. Mary's cemetery, Flushing, LI under the direction of John J. Keegan. CHARLES A. FLANAGAN, a retired member of the New York Police Department, died on Friday at his home, 506 Second Avenue, Long Island City. Age              66y 6m 22d, Male, White, married. deceased         from Dec 26, 1917 to Jan 11, 1918. NOTES from PF: Certified carbon copy in Emily Flanagan papers. Typewritten, signed by asst. registrar. No informant was named, so the source of the questionable items is unclear. Emily FLANAGAN was the most likely source, but having known Emily, I don't expect errors of this nature from her. Perhaps one of the sons-in-law ( Bill Dempsey or Thomas F. Fagan) not familiar with Anna's background, dealt with the coroner. Anna's father, George EVANS was born in Bristol, England, not NYC. Her DOB: most cited is Feb 22, 1855, however we have conflicting information regarding the year. Furthermore. George Evans reported himself as childless in a bank account opened Sep 26, 1857 and Anna was not included in her parents' 1860 census listing. I have found no baptismal record for her. Checked so far: St. Peter's on Barclay St, where her parents married. This is the only direct reference to Margaret's father's name. However there was an undated obituary in Anna's papers for a Johanna SCANLAN, wife of a Thomas CROUGH who died in Montreal. I believe this Thomas was her brother. Re the spelling CROFT, this may have been a case of mishearing. We have spellings CROW, CROWE and CROUGH elsewhere. EVANS, on Monday July 10th, 1911, Margaret EVANS, beloved mother of Mrs Charles A. FLANAGAN. Funeral from her late residence 506 Second Ave, Astoria, LIC, Wednesday July 12, at 10am, our Lady of Carmel, Astoria, where a requiem mass will be sung for the repose of her soul. Interment Calvary Cemetery.